Facebook is one of the easiest ways to take a stroll down memory lane, what with its endless collection of your ancient photos and comments. But while Facebook usually highlights memories from years past, now it’s adding options for more recent memories too. The company is today launching a new experience that recaps memories from the past month or season. At first glance, it’s a little puzzling; we imagine most people don’t have such short term recollection that they need to be reminded what happened a month ago, and it’s not like I don’t already have enough recap notifications on Facebook. On the other hand, it’s a useful feature for bundling photos from recent events into one package, instead of scouring through your albums. It’s only visible to you by default, but you can of course opt to share the memories with your friends. In related news, Facebook says its On This Day feature – which shows what you were up to on the same date in years past – is now available to everyone on Facebook. The company also made it easier to control what shows up on the feature, while improving it’s algorithm in the first place. Finally, Facebook is adding a feature that celebrates certain milestones in the network, like reaching 100 friends or 1,000 likes. 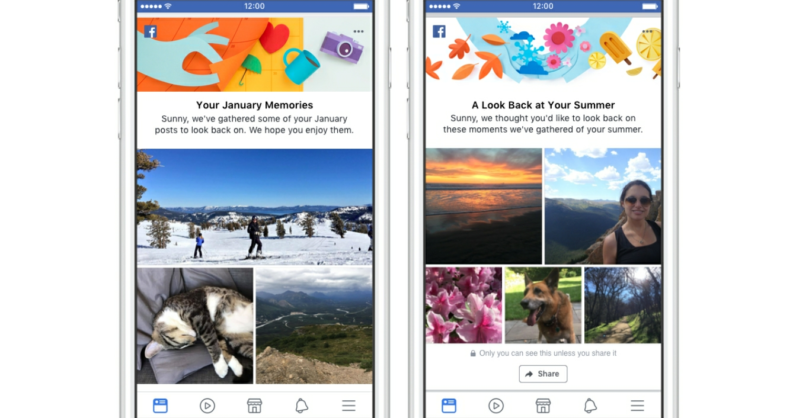 Facebook intends to expand it with more milestones soon, as well as allow you to publicly share the achievements. There are plenty of jokes to be made about people celebrating how many Facebook likes they have – it’s a lot like gaming achievements for the social media-obsessed. But the intent seems to be helping people feel good about their online interactions. In a world where we’re consistently bombarded with online negativity, a little bit of celebrating probably doesn’t hurt.